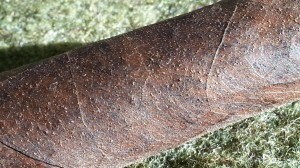 Pre-Release Mini Review: TLJ Legend Reserve 63 Maduro "Reborn"
Home » Cigar Reviews » TL Johnson » Pre-Release Mini Review: TLJ Legend Reserve 63 Maduro "Reborn"
As you can see in the picture at right, the wrapper is an evenly-colored dark brown with significant tooth. Even with the more coarse texture stemming from this toothiness, it is quite oily to the touch. Seams and veins are visible but inconsequential. 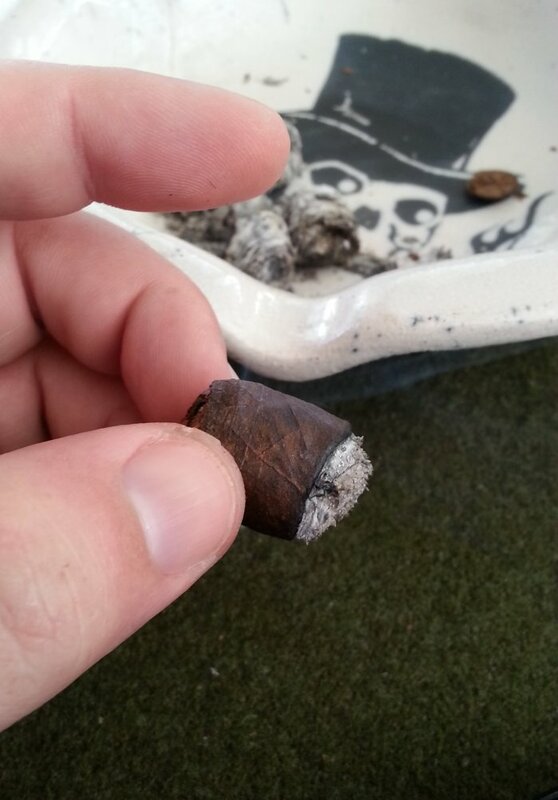 Overall, the construction appears to be spot-on, and the cigar feels dense and evenly packed. Pre-light, the draw is deliberate but free and provides little in terms of flavor outside of a faint hay. Additionally, the aroma on the wrapper is similar. However, the aroma from the foot comes through very strongly with marked sweet, heavy cedar. This was not entirely expected from the first observation, but was a welcome surprise. Once lit, the first couple of puffs from the stick are a bit sharp and spicy through the nose. However, I have to admit this dissipated about as quickly as any cigar I’ve ever smoked. Within a minute or two it had settled into a lovely, dark, sweet-bread flavor with just a bit of cinnamon. Cinnamon is a flavor I will very rarely put into a cigar review, but it is definitely called for here. It’s quite clear and bold. 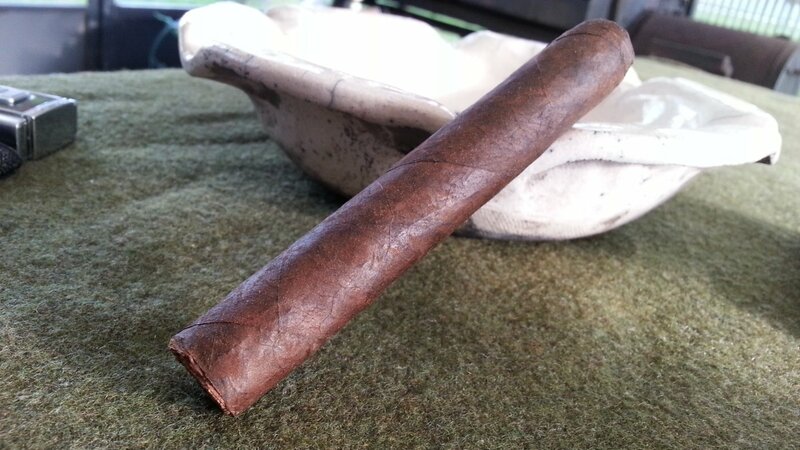 Heading into the real “meat” of the cigar, it seems somewhat enigmatic in its smoke production. When seated on the cradle of the ashtray, it almost appears to have gone out rather quickly…but a quick puff draws a great deal of smoke. In fact, the burn is progressing impeccably with this stick. The flavors remain much like those early minutes: sweet and dark, with perhaps a bit of molasses at this point. 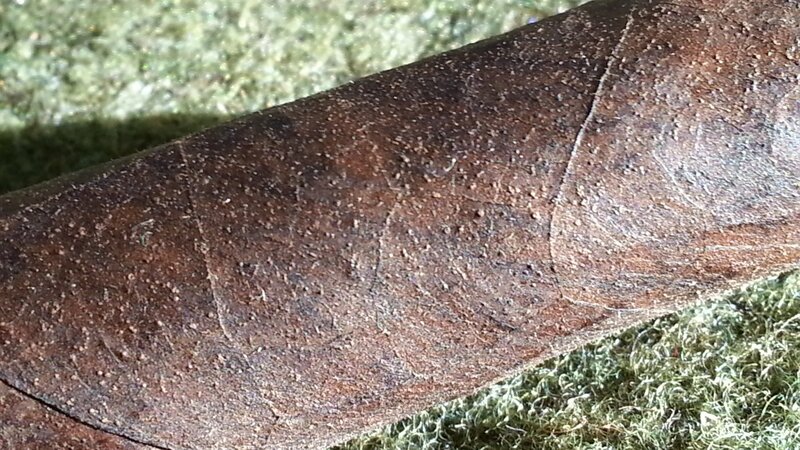 Somewhere about midway through the cigar, I have begun to notice some cedar coming through. It never overtakes the earlier sweetness, but rather complements it well. I’ve paid particular attention to the physical attributes of this cigar, and I have to give kudos to Luis. The construction has been truly flawless. In fact, I’m glad I only had one of these, and that it is a pre-production sample. If I’d had to publish a formal review for this cigar as the first using my new standards I fear it might have scored highly enough to make me question my method. Going into the final stretch, the flavors continue to intensify with little impact on overall strength. I’d place the Legend Reserve 63 Maduro firmly into the fuller end of medium in terms of strength – but absolutely full-flavored. The sweetness has endured throughout its length with the cedar for much of it – and perhaps some lemony citrus notes in this final third. There was a point in this section that shifted into a more leathery profile, but only briefly. I’ll be perfectly honest. I’ve been a fan of Luis Sanchez’ cigars, and even specifically the TL Johnson lines from him in the past – as well as Mexican San Andrés leaf. That being said, this was a spectacular smoke. It’s always a tricky business introducing a new – or reblended – cigar to market at or above the $10 mark, and when premium components and craftsmanship are brought more into play it is sometimes even more so. Nonetheless, if this cigar comes to market of the same build, blend, and quality I could absolutely see it occupying space in my humidor. I have no higher recommendation to give. It was absolutely delicious. Ah, ever the San Andres fan, you are! I’d like to try this, even tho I’ve disliked both of the TLJ sticks I’ve had in the past. Thanks for the write-up.